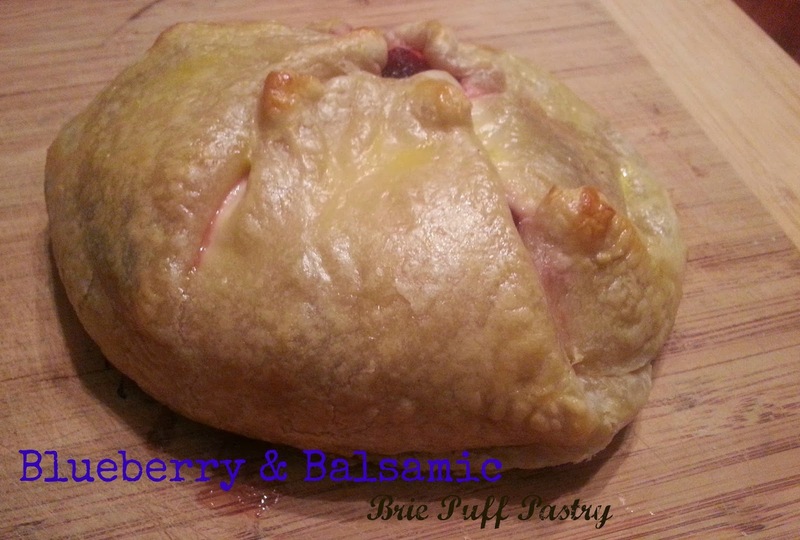 and then this came about because of a cranberry relish left over from thanksgiving and my friend Rhonda was looking what to make with it and I hinted at the puff pastry and then I wondered why not do a similar version with my blueberries! in a sauce pan, combine the blueberries, balsamic and sugar. simmer on low heat for about half an hour or till it reduces. After it has cooled, place puff pastry on greased cookie sheet. Place brie round in center of pastry and pour the blueberry balsamic reduction over it. Take the edges of puff pastry and crimp together over the brie and blueberry mixture. Whisk egg and water together and brush over top of puff pastry. you can enjoy this with crackers, but I think I recommend with crusty bread! 2 comments on "Blueberry & Balsamic Brie Pastry"
I love baked brie and with blueberries sound amazing!